The Gazelles rocking Marple Baths. It was given to the community, which is defined as the area of the old Marple UDC, stretching from Etherow in the north to High Lane in the south; Mellor in the east to Dan Bank in the west. The building was opened on Saturday 16th May, 1931, one of the lowest points in the Great Depression of 1929 - 1939. The largest bank in Austria had declared insolvency earlier that week, triggering a string of bank collapses across Europe. A few weeks later Britain left the gold standard, the pound was devalued by 25% and unemployment benefits were cut by 20%. The people of Marple needed cheering up and this certainly went some way to that end. The building was opened by Mrs Mary Macnair, the lady who had donated the building in memory of her husband, Andrew Macnair. They lived at The Shanty, a notable Arts and Crafts house on Church Lane, and he had died in 1922.They both loved Marple and she decided to give the town a permanent memorial to her husband. Her original idea was to provide a communal bath house as many of the houses in the area were still without bathrooms. However, after discussing her ideas with her doctor she decided to finance a swimming pool as it would benefit a wider section of the community, particularly the children. It was a simple building, even sparse, but at that time it was a luxury enjoyed by very few communities. It had cost £8,000, the equivalent of about £500,000 in current values. The building on Stockport Road looked much as it does today. Inside there was a 25-yard pool with changing cubicles down each side. Males on one side, females on the other: you changed into swimming costumes with a curtain to protect your modesty, put your clothes in a cloth bag and then took it to a room at the end of the baths. You then had to go through a couple of foot baths, on either side of the diving board. The hot water and carbolic soap were there to ensure your feet were clean before going into the main pool. Sometimes, if it was cold, you would sit on the floor with your feet in the hot water, warming up before braving the main pool. The pool was used by everyone, and it was not just restricted to Marple. Adults as well as children, formal bookings as well as general sessions open to all. 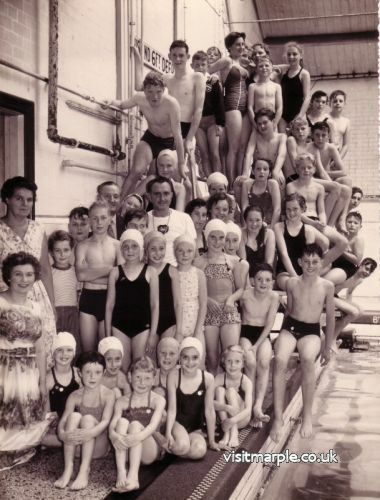 Schools were encouraged in order to teach as many children as possible to swim and Marple Council made a point of extending the use to schools outside their area - Romiley, New Mills and further afield, because Mrs Macnair specifically requested that it should be made available to all. The informal sessions were much more relaxed. The changing cubicles around the edge of the bath left precious little room alongside the pool. Bathers chasing each other around the periphery could easily displace a curtain to reveal a youth struggling into his costume. In the winter, and important occasions in the summer, the pool was boarded over and a ‘beautiful sprung floor’ laid for the dances. The wooden cubicles folded back against the walls. Key events were the New Year’s Eve Ball, the Farmer’s Ball and the Mayor’s Ball. On these occasions Tom Davenport, the Parks Superintendent would do the floral arrangements. It was not just confined to dances; in the absence of any other public building with similar space it was a real asset to the community. There were band concerts, local skiffle and rock groups, visiting entertainers such as Mike Yarwood and even one or two Billy Graham type evangelists conducting public baptisms. (There was obviously no shortage of water.) On at least two occasions in the 1960s the council staged a “Welcome to Marple” exhibition for the benefit of the newcomers to the town. Local organisations of all types laid out their stall in the wooden cubicles they were allocated. There were changes over time, of course. The curtains on the cubicles were replaced by wooden doors and the extension, built in the 1950s, created space for proper changing rooms. What luxury! Space has been found for a small gym by using what was the flat for the manager and the diving boards have been taken away, presumably on grounds of Health and Safety. 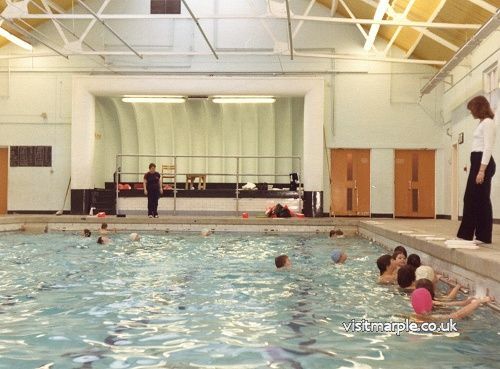 The pool and the council have tried to keep up with changing tastes and different requirements but there is no doubt the facility is showing its age. It is the oldest swimming pool in Stockport MBC and looks it. The pool has been closed, initially because of problems with the filtration system, but more problems seem to be emerging as investigations proceed. £2.7 million would be required to bring it back to its current form but it would still be running at the capacity of the existing structure. The council are committed to providing this type of amenity and are looking into the possibility of a new, modern, facility but the money will be hard to find in the present period of austerity. 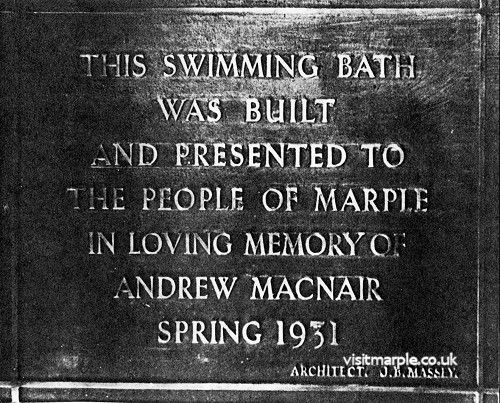 Thanks to Mrs Macnair’s extremely generous gesture, Marple Pool has been part of our heritage for almost a century. We need to look after our heritage but the aim must be conservation, not necessarily preservation. The Pool should not be kept immutable, preserved in aspic as it were. It has already changed over time but now we should support a much bigger change and demonstrate to our councillors how much the Pool means to all of us. We owe it to Mrs Macnair - she would expect nothing less. 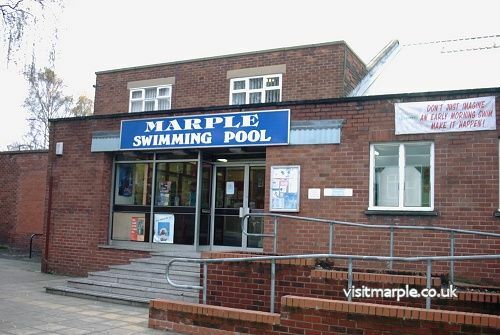 Architecturally, Marple swimming baths is relatively plain for a public/civic building. The construction techniques used and architectural details incorporated are more associated with industrial buildings of the time. In particular the exposed steel trusses spanning the main pool area are made from metal angles, bars and plates all bolted together. The original main pool and front entrance areas were well designed to utilise the slope of the site for functional and economic reasons. The deep end of the pool was built at ground level and, as the site rises, the bottom of the pool rises similarly, following the original contours of the site to the shallow end. Thus the whole of the pool bottom is at the original ground level. This saved both excavation costs and construction costs below ground level. Most importantly, this had the advantage of placing the whole of the pool above ground level. When a swimming pool is emptied of water, hydrostatic pressure in the adjacent ground, especially underneath, causes the main body of the pool to want to rise out of the ground, just like a ship’s hull in water. Constructing the pool above ground level resolved the need for ground anchors to hold the pool down in the ground. However, the downside of this design necessitated access into the building via several steps to reach poolside level. In the 1950s dedicated changing rooms were added along with living quarters at first floor level for the superintendent and his family. Direct access to the flat was via external steps at the rear. Over the past few decades various refurbishments of the baths have been undertaken in order to comply with current regulations and expectations. These have included an access ramp to the main entrance, retiling of the pool and changing areas and the conversion of the superintendent’s flat into a small gym at first floor level. A simple yet eminently functional building that has served the community well for 87 years.